We’ve had a lot of excitement in the store lately, between our Warehouse Sale and all the buzz generated by DC’s 3D covers. 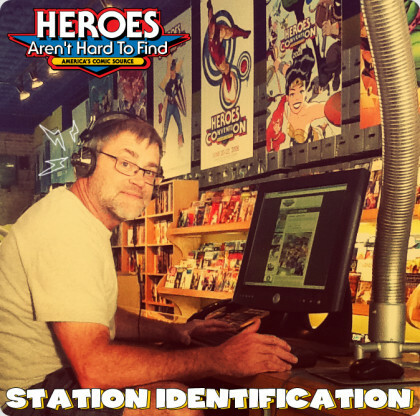 We thought this would be a good time for a general “station identification.” Of course we’re known as the folks who organize great events like Heroes Convention, Charlotte Mini-Con, Heroes Pop Swap, and our annual Free Comic Book Day celebration. We’re also a good old-fashioned brick and mortar comic book store with the best selection of new monthly comics and back issues. SERVICE: We have a friendly, knowledgeable, and comic-loving staff that is always ready to help you find the books you want and offer new recommendations when you ask for them. SELECTION: Not only do we aggressively reorder items for the store on a weekly basis, but our customers have access to a huge back stock of organized modern and silver age back issues that is constantly growing as we buy collections. If you don’t see a book you want on the shelves, just ask and we’ll find it for you. Did we mention we buy collections? We look at collections every single day, and offer fair prices for your books in cash or store credit. We take time to explain how we arrive at our offer, and do so in a plain and informative way. SUBSCRIPTIONS: Subscribers receive 10% off new comics & 25% off back issues. Click here to see our Subscription form for more details. If you don’t live close enough to drive to our store on a regular basis, we also offer our subscription service to shipping customers. Just let us know if this is something you’d be interested in, and we’ll work it out on a case-by-case basis. PRE-ORDERING: Don’t miss out on the books you really want! Our subscribers who requested DC 3D covers in advance had their requests filled. We always make a point to fill special orders each week before any new books ever hit the shelves. It’s as easy as submitting a Previews order each month, or letting a staff member know what items you’d like, and we’ll make sure you get them. We fill orders in the order in which we receive them while supplies last, so make sure you get your requests in early! ONLINE STORE: In addition to the Heroes Blog being the go-to place for weekly updates on new releases, HeroesCon news, and more, we’re also expanding our ecommerce options in the coming months. We’ll be adding more and more items to the Heroes Web Store and the Heroes eBay store, while continuing to offer Heroes and HeroesCon exclusive comics and t-shirts. 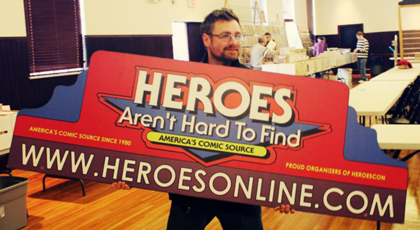 EXPERIENCE: Heroes founder and owner, Shelton Drum, has been selling new comics to subscribers since 1973! That’s 7 years before Heroes Aren’t Hard to Find even existed as a brick and mortar store! For forty years, Shelton has assured that folks will get the comics they want in a timely manner, and that’s the way we intend to keep doing things. HEROES HOTLINE: Sign up for the Heroes Hotline, our Wednesday and Friday newsletter featuring each week’s New Releases list and news about upcoming Heroes store events, HeroesCon updates, and our appearances at other cons around the country. We’re proud to be a big part of a great comics community, and aim to remain the best-stocked, most organized comic store in the region.